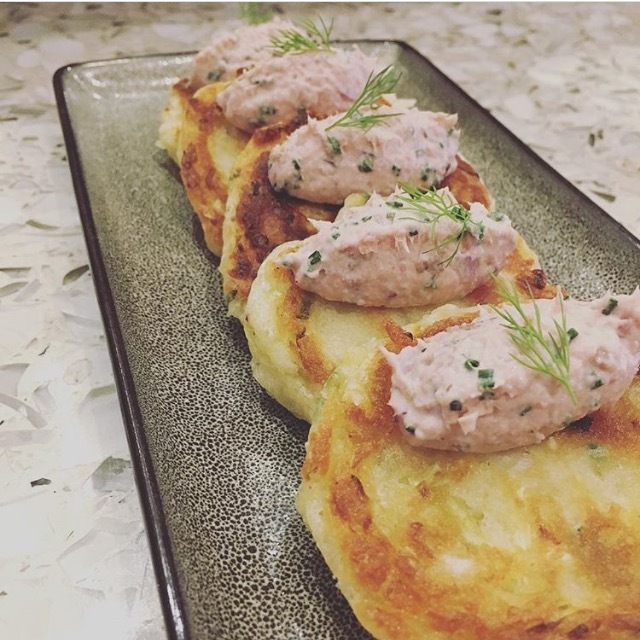 In 2015 the two Culinary Institute of America grads opened Preserve, a 42 seat eatery serving fresh and preserved local dishes like griddled sauerkraut cakes with smoked ham hock rillettes (below) and fried Brussles sprouts with worscestershire mayo and pickled beets. 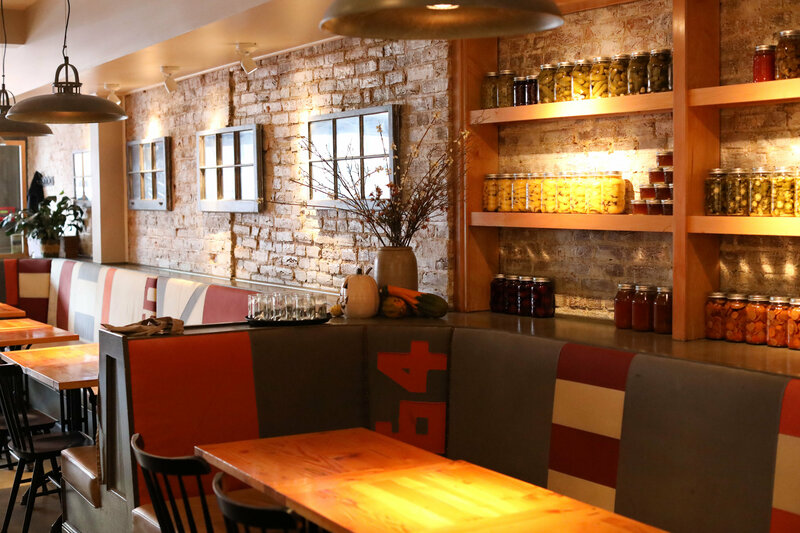 Like the name suggests, the menu leans heavily on canned, pickled and fermented foods from their preserved food line, Cabbage Alley. 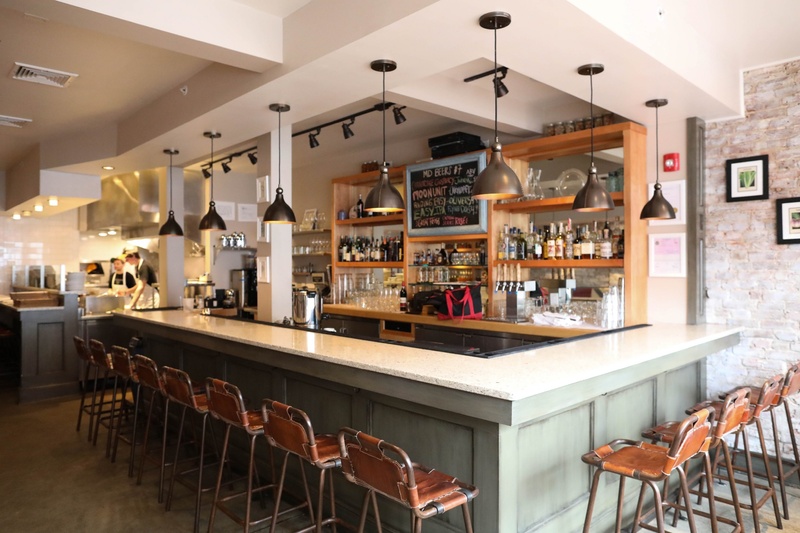 The restaurant features an open kitchen and the centerpiece of the dining space is a long L-shaped recycled glass bar top in subtle green and neutral tones, surrounded by rustic industrial leather stools. Local Vetrazzo distributor Matt Gordon of Imagine Surfaces spoke with Michelle about the design of the restaurant which includes many recycled and repurposed elements. 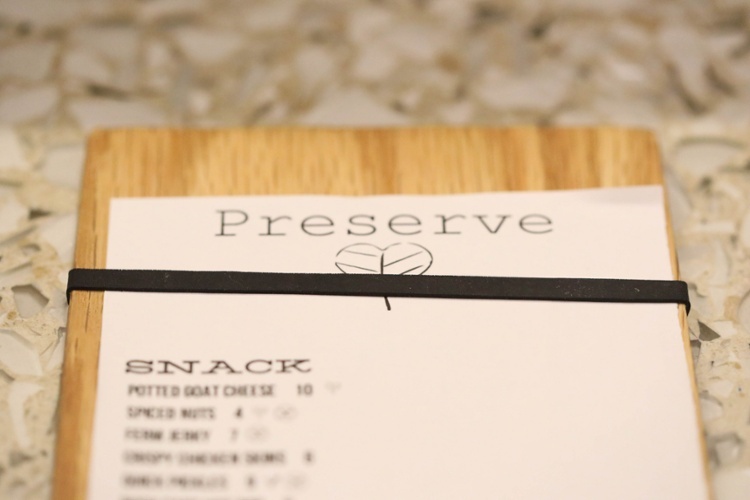 According to Michelle, a commitment to environmentally friendly practices is a literal part of the handbook at Preserve, in everything from local food to green packaging and recycled decor. “Our policy allows us to relay our commitment to the environment in a tangible, beautiful way.  Vetrazzo is only one of many ways we try to do repurposed or environmentally friendly design,” Hoffman said. The Hoffman's selected Glass House for their recycled glass color mix. The neutral hues work as easily in residential projects as they do in commercial design. 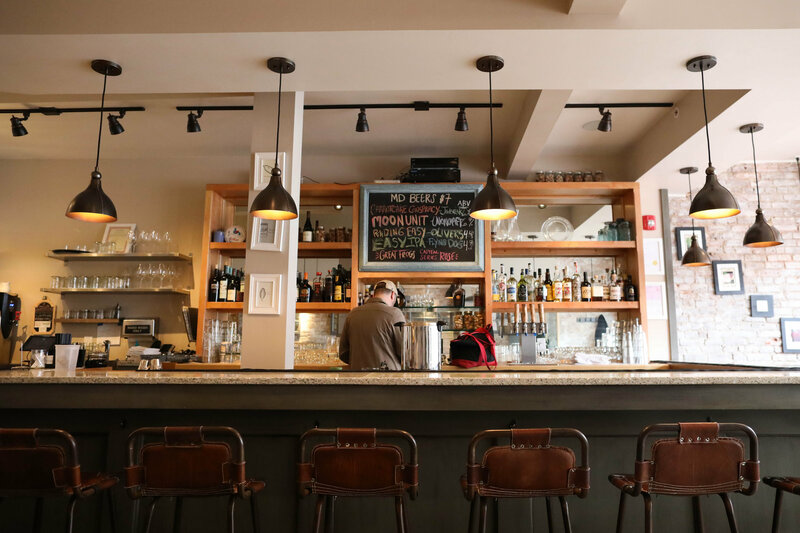 “We repurposed old windows into mirrors, stitched different samples of commercial grade fabric to look like old sails on our banquette seating area and we sourced sustainably forested wood for all of our table tops, just to name a few,” Hoffman said. Clear glass condiment jars are one of the main ingredients in Glass House which gives the surface it's light color and delicate sparkle, with just a hint of color - an occasional cobalt vodka bottle shard or green glass bottle fragment give each slab some extra unique character - no two are the same. The surface is also extremely durable, obviously key for hospitality design. 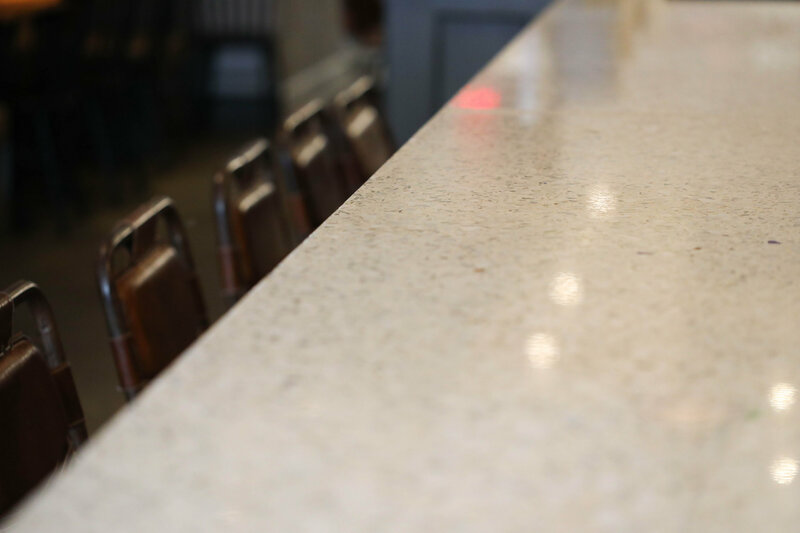 The Hoffman's decision to include Vetrazzo's recycled glass countertops in their design is a great example of upcycling and shows their true commitment to sustainability. 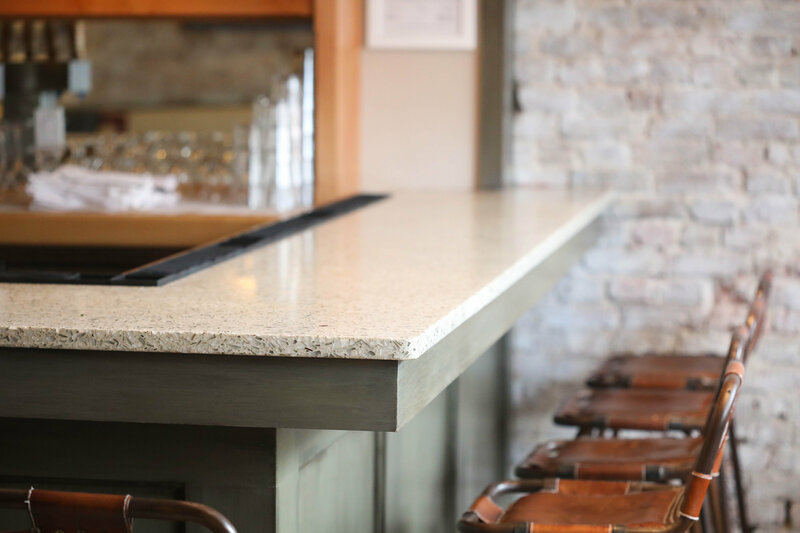 Like the banquette upholstery that they stitched together from fabric samples, these recycled glass countertops take a common disposable commodity and give it both a greater value and longer life span than its previous form. When Vetrazzo craftsmen hand make their slabs they're using glass that is diverted from land fills. Rather than heating the glass to 3,500 degrees in giant furnaces to remelt and form it into new glass products which consumes a massive amount of energy, they only have to use the crushed glass itself and mix it with the cement binder for the finished product saving tons of energy and reducing the carbon footprint of the material. The final ingredient that makes the Vetrazzo counter into a sustainable showpiece is the same ingredient that the Preserve team adds to their dishes - artisan passion. And the guests at Preserve get to enjoy both in their dining experience.